Information about all things related to Shooting and Hunting – Condensed and precise! It’s dark and you stayed in your tree stand a little too long. This is a new area you are hunting and now you are lost. Panicked you look at your cell phone and see “searching for signal.” You look up at the trees and glance around your surroundings – nothing looks familiar in the twilight and you have no idea how to get back to camp. You could fumble with a compass and try to remember if you went .5 mile north or northwest. Did you go east after you crossed the river? Suddenly your panic subsides when you reach into your pocket and grab the Bushnell Backtrack D-Tour GPS. Anyone who has gone hunting on unfamiliar lands or hiking in the woods has experienced at least a moment of uncertainty when you realize you may be lost. Bushnell just introduced a new personal GPS unit that will quickly become your best friend. It’s not over complicated and is easy to use. Think about it – who needs a cumbersome, difficult unit when they are wandering around the woods? Just follow the arrows back to your campsite. It’s a personal GPS “for dummies” unit. The unit is sporty and rugged. Weighing just six ounces, it clips on your pack or will fit easily in your pocket. The weather-resistant body has a grayscale LCD screen with an internal, rechargeable battery good for 48 hours of data logging. It runs on just 3 AAA batteries running for an estimated 16 to 18 hours out lasting any cell phone or most other types of portable GPS units. You can store up to five locations, with the course taken, length in miles and yards, time, latitude, longitude, and other handy metrics to help you recall the exact location of your adventure. It’s easy to upload the information to your computer using the included USB cable. Simply plug-in the device to see your route with Google maps including the timings, distance and direction. With a few clicks you can share your adventure with social media, email or the web. The D-TOUR includes a self-calibrating digital compass, time, temperature, and altimeter. Whether jogging, hiking or even lost in a mall Bushnell has you covered. Back track to your exact location with no detours. At just $100 it’s worth every penny not to have your wife nag you to ask for directions or to make it back to camp in time for dinner. 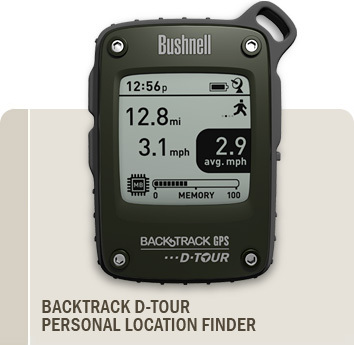 For more information on the Bushnell Backtrack D-tour check out Bushnell’s website or their Facebook page. The website it is a great resource including a product demo video. When you try out this handy lifesaver email Danny at danny@carduccitactical.com and tell us how you liked the new model. Before I scout out my hunting camp later this summer I will have one in my pack. Hunting just got easier.